Are You Making This Critical Weight Loss Mistake? Many people trying to lose weight start looking at the number of calories they eat, or the amount of fat they put into their body. Often, this involves looking at the nutrition facts label on a product. The nutrition facts label is a useful little gem. It can act as a great weight loss tool if you use it wisely. It tells you how many calories are in the product, as well as how much fat, carbohydrate, protein, sugar, and fiber, amongst other things. 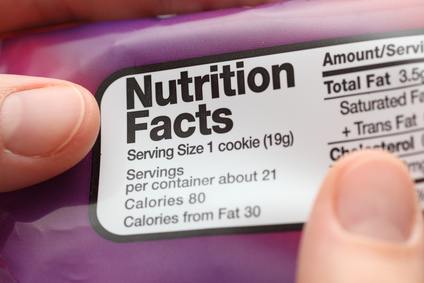 Unfortunately, many people are making a critical error when reading the nutrition facts label. They ignore the serving size. Every nutrition facts label has to include the serving size. All other information on the label is per serving. That means the number of calories is per serving, the amount of fat is per serving… I think you get the point. So if you pick up an item, look at the nutrition facts label, see that it only has 100 calories and 10 grams of fat, but ignore the fact that one serving is so minuscule that it wouldn’t satisfy a gnat and you are actually going to eat 7 servings, your weight loss endeavors are probably going to suffer. Companies are smart. They know that most consumers who bother to read the nutrition facts label want healthy food. So they manipulate the label to make the food seem healthier than it is. They do this by making the serving size unrealistically small. That way the number of calories on the label is small, but the reality is that you are going to eat multiple serving sizes. Work out how many servings you are going to eat. Multiply all of the numbers on the label by the number of servings you are going to eat. Even if you are not trying to lose weight, but just want to make sure your food is low in sodium, high in fiber, or otherwise healthy, knowing how to read and understand the nutrition facts label is absolutely crucial. Previous Post: « Gluten – Friend or Foe?